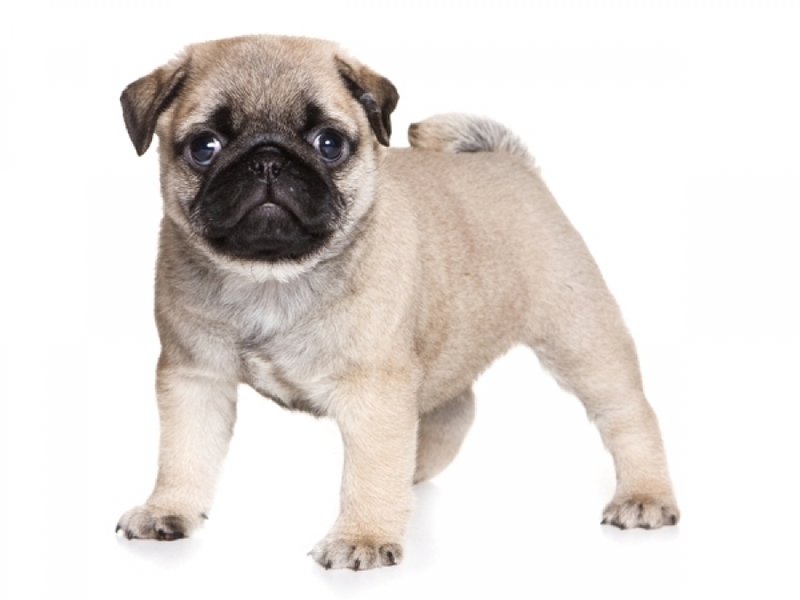 The pug is a "toy" (very small) breed of dog with a wrinkly, short-muzzled face, and curled tail. The breed has a fine, glossy coat that comes in a variety of colors, and a compact square body with well-developed muscle. They have been described as multum in parvo ("much in little"), referring to the pug's personality and small size. Known in ancient China as lo-sze, they may have been responsible for both the modern Pekingese and King Charles spaniel. They have Chinese origins, but were popularised in Western Europe by the House of Orange of the Netherlands and the House of Stuart of England, Ireland and Scotland. A small black dog puppy being held up by his owner. A fawn pug and a black pug looking up. Their smooth, glossy coats can be fawn, apricot fawn, silver or black. There is also the rarer white pug which gets its coat via breeding or albinism. A silver coat is characterized by a very light coloured coat, absent of black guard hairs. A silver pug typically has a very dark head, with no clear delineation at the mask, and dark forelegs. The markings are clearly defined. The trace is a black line extending from the occiput to the tail. The tail normally curls tightly over the hip. Strong willed but rarely aggressive, the pug is suitable for families with children. The majority of the breed is very fond of children and sturdy enough to properly play with them. They can be quiet and docile but also vivacious and teasing depending on their owner's mood. They can't really make good watchdogs; although they are always alert and sometimes yappy. "A black and white photo of a pug facing the camera, turning its head. A man wearing a red robe and a black hat in a mirror. A small yellow dog with a black nose and ears stands beside the mirror. Hogarth with his pug, Trump, in 1745. Bred to adorn the laps of the Chinese sovereigns during the Shang dynasty (before 400 BCE). They were known as "Lo-Chiang-Sze" or "Foo" (ceramic foos, transmogrified into dragon, with their bulging eyes are similar in appearance to the pug). References to pug-like dogs have been documented as early as 551 BCE by Confucius, who described a type of "short mouthed dog". The lo-sze or early pug may have been the predecessor of today's modern Pekingese. The pug's popularity spread to Tibet, where they were mainly kept by Buddhist monks, and then went on to Japan, and finally Europe. The exact origins of the pug are unknown, as Emperor Qin Shi Huang, the first Emperor of China, destroyed all records, scrolls and art related to the pug at some point during his reign which lasted between 221 and 210 BCE. The popularity of the pug continued to spread in France during the eighteenth century. Before her marriage to Napoleon Bonaparte, Joséphine had her pug, Fortune, carry concealed messages to her family while she was confined at Les Carmes prison. The pet was the only recipient of visiting rights. The pug was also well known in Italy. In 1789, a Mrs. Piozzi wrote in her journal, "The little pug dog or Dutch mastiff has quitted London for Padua, I perceive. Every carriage I meet here has a pug in it." In paintings and engravings of the 18th and 19th centuries, they usually appeared with longer legs and noses, and with cropped ears. The modern pug's appearance probably appeared after 1860 when a new wave of pugs were imported directly from China. These pugs had shorter legs and the modern style pug nose. Ear cropping was outlawed in 1895. The pug arrived in the United States during the nineteenth century (the American Kennel Club recognized the breed in 1885) and was soon making its way into the family home and show ring. In 1981 the pug Dhandys Favorite Woodchuck won the Westminster Kennel Club show in the United States, the only pug to have won since the show began in 1877. The World Champion (Best in Show or BIS) at the 2004 World Dog Show held in Rio de Janeiro, Brazil was a pug, Double D Cinoblu's Masterpiece. The Pug Dog Club of America was founded in 1931 and recognized by the AKC that same year. Pugs have large, expressive eyes and a wrinkled face with a long tongue. Improper care of the wrinkles may sometimes cause adverse health effects. Since pugs lack longer snouts and prominent skeletal brow ridges, they are susceptible to eye injuries such as proptosis and scratched corneas and painful entropion. They also have compact breathing passageways, leaving many unable to breathe properly or efficiently regulate their temperature through evaporation from the tongue. A pug's normal body temperature is between 101 °F (38 °C) and 102 °F (39 °C). If the temperature rises to 105 °F (41 °C) they are no longer able to cope with cooling themselves and their oxygen demand is greatly increased, and requires cooling down immediately. Should the temperature reach 108 °F (42 °C), the internal organs begin to break down at a cellular level which can lead to severe long term health issues or even death. A fawn colored pug looks off to the left whilst standing in a field of grass. As they have many wrinkles in their faces, owners normally take special care to clean inside the creases, as irritation and infection can result from improper care. Hip dysplasia is a major problem for the breed, with 63.8% of pugs being affected according to a survey performed by the Orthopedic Foundation for Animals, and they were ranked second worst affected by the condition out of 157 breeds tested. The pug, like other short-snouted breeds, has an elongated palate. When excited, they are prone to "reverse sneezing," where the dog will quickly, and seemingly laboriously, gasp and snort. The veterinary name for this is Pharyngeal Gag Reflex. This is caused by fluid or debris getting caught under the palate and irritating the throat or limiting breathing. "Reverse sneezing" episodes are usually not harmful to the pug and resolve themselves. Massaging the dog's throat or covering its nose in order to make it breathe through its mouth can often shorten episodes. Pugs have been featured in television and film, including Frank the Pug in the film Men in Black, its sequel and the follow-up animated series. Other films featuring the breed includes Hotel for Dogs, The Adventures of Milo and Otis, Disney's Pocahontas, 12 Rounds, Marie Antoinette. Dune, and The Great Race. On television, they have appeared in shows such as The King of Queens, Spin City, Legend of the Dragon, The West Wing and Eastenders. Pugs have also appeared in a variety of fictional print media, including the hypnotic Petula in the "Molly Moon" series, Lady Bertram's pug in Mansfield Park and in the book Pugs: God's Little Weirdos, a spin off from the Sheldon web comic. They also featured in Nintendogs for the Nintendo DS handheld video game console and a "Perky Pug" pet can be accessed in Blizzard Entertainment's World of Warcraft. Cheeka is a famous pug who appeared in the "You & I" advertising campaign of Hutch's cellular service, Vodafone, in India. Celebrity pug owners include financial talk show host and best selling author Dave Ramsey, comedienne Maria Bamford, broadcaster Jonathan Ross, actress Jessica Alba, actor Hugh Laurie, guitarist Jamie Jazz, fashion designer Valentino Garavani, footballer Zlatan Ibrahimovic, actor Gerard Butler, actress Jenna Elfman and musician Rob Zombie. In a 23 May 2007, web issue of The Onion, the breed was lampooned in a satirical news article titled "Dog Breeders Issue Massive Recall of '07 Pugs". The piece satirized pugs and their breeders by writing of the dog and its characteristics as a faulty product, "evidenced" by a fictional quote from the American Pug Breeders Association director: "While pug owners are accustomed to dog malfunction, the latest animals are prone to more problems than just the usual joint failures, overheating, seizures, chronic respiratory defects, and inability to breed without assistance. The latest model Pug is simply not in any way a viable dog."